Food operators need top quality measuring instrumentation. Australia’s food industry involves a massive degree of competition. With low barriers to entry, constantly changing consumer preferences and the rise of intermediaries like Uber Eats, it’s more important than ever that our food industry delivers top quality cuisine and an all-round satisfactory experience. None of that can happen with poor preparation. Customers want fresh and flavourful dishes, and one poorly prepared meal can result in damaging reviews or serious health and safety concerns. That’s why everyone, from high-end restaurateurs to local franchisees, has to use the best measurement instrumentation available. With Testo, you ensure the following areas of your business perform at their peak. From the weekly delivery of fresh fish to the daily trip to top up your fruit or vegetable stocks, every single item must undergo rigorous checks from the moment it enters your premises. Food can spend a long time in transit from the wholesaler to your door, in a wide variety of conditions. Without checks on incoming goods, food services providers risk letting poor quality goods into storage where they can impact the rest of your inventory. The testo 104-IR Infrared & Probe Thermometer is perfect for dealing with incoming goods. A hazard analysis and critical control points (HAACP) certified and IP65-rated integrated probe and infrared laser, operators can use it to analyse incoming goods, perform impromptu quality checks or conduct any other surface and core temperature measurements. Its high degree of accuracy, durability and speed means you get non-contact readings whenever you need them. 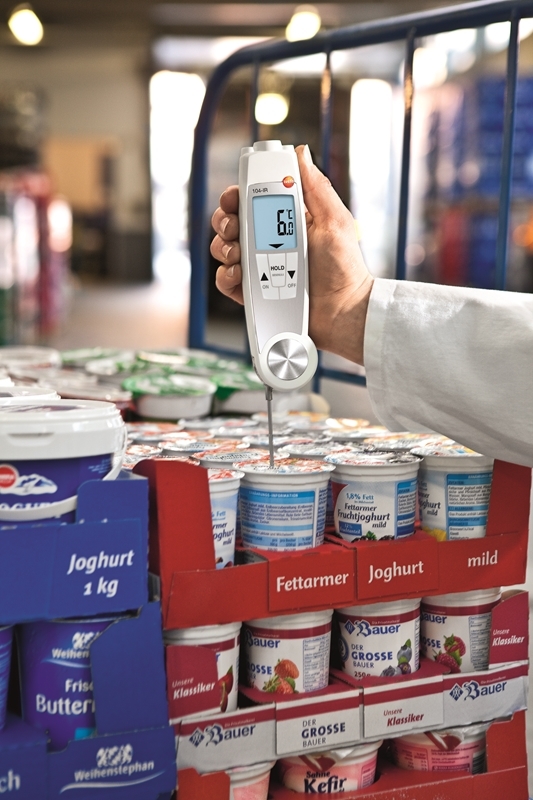 The Testo 104-IR is perfect for managing the quality of incoming goods. Measuring food quality while it is in storage is a more long-term process than a spot check or review of incoming goods. While in refrigeration or workrooms, you need instruments and a system that allows you to check the temperature of goods at any time, from any location. If food spoils, you need to know about it immediately. At the same time, operators need to find a level of efficiency that means they are not constantly returning to the same space to check temperatures. This is where the testo Saveris 2-T1 proves essential. This is a Wi-Fi data logger that comes with clear display and integrated NTC temperature probe, giving you a highly accurate temperature read 24 hours a day, seven days a week. It is a vital automation tool for anyone operating in the food industry. Simple to install, the Saveris 2-T1 enables you to check the temperature of a room from any tablet, smartphone or PC at any time through the built-for-purpose Testo Cloud. You can also set specific limits, and receive alerts to any PC, tablet or smart phone when temperatures approach or breach that limit. From freeze applications to ambient storage, you get fast and accurate readings. The Testo Saveris 2-T1 automates some of the most inefficient parts of monitoring temperature. Despite the numerous variables involved, food preparation is a process with no margin for error. Oil temperatures, oven settings and thawing food require the utmost accuracy in terms of temperature reporting – the slightest error can result in catastrophe. Testo has custom-built instrumentation to address every temperature-related issue a food operator may encounter. The testo 270 is a cooking oil tester that saves time and money for all costly frying appliances. Meanwhile, the testo 108-1 digital food thermometer can conduct rapid spot checks with clear results. Operators can also use the testo 108-1 in conjunction with the testo Saveris 2-T1 for even greater specificity in their food storage monitoring. Finally, the testo 104 folding thermometer is a flexible, robust instrument that can probe goods without leaving a trace, giving you core readings with the added ability to navigate tight or difficult-to-reach spaces. It isn’t enough to have generic food thermometers. In such a competitive environment, with so little room for error, you need built-for-purpose instruments that minimise inefficiency and deliver results. That’s the difference Testo’s range can make.